U.S. Senator Harry Reid, Secretary of the Interior Dirk Kempthorne and Pyramid Lake Paiute Tribal Chair Mervin Wright gather for the signing of the Truckee River Operating Agreement. This video also features a welcome from Reno Mayor Bob Cashell. (Submitted news) — The Truckee Meadows Water Authority (TMWA) and KNPB Channel 5 Public Broadcasting present “Taming the Turbulent Waters,” a half-hour documentary celebrating the historic signing of the Truckee River Operating Agreement (TROA), which occurred on Sept. 6, 2008. The next airing is Nov. 23 at 7:30 p.m. on Ch. 5. “Taming the Turbulent Waters” will air this November and December on Reno’s KNPB and PBS stations across the west. The program explains the more than 20-year history of TROA, including how U.S. Sen. Harry Reid brought all parties to the negotiating table, and the benefits to the water system and to residents of the Truckee Meadows. It includes interviews with Sen. Reid, TROA negotiators and representatives from the signatory parties. The documentary was produced by Arrowhead Productions in conjunction with TMWA and Sen. Harry Reid’s office. For general TROA information, visit www.tmh2o.com/water_system/settlement/ or call (775) 834-8080. 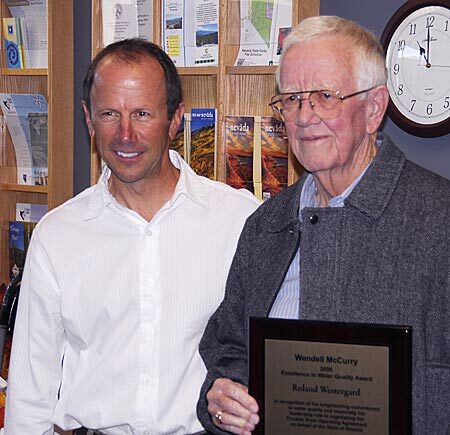 CARSON CITY, Nev. — Longtime water resource advocate Roland Westergard was recognized today by the State of Nevada for his lifetime of dedication to the protection of the state’s precious water resources. The Nevada Division of Environmental Protection (NDEP) presented its 2008 Wendell McCurry Excellence in Water Quality Award to Westergard at a ceremony at the offices of the Nevada Department of Conservation and Natural Resources (DCNR) in Carson City, with members of his family and many friends and colleagues in attendance. The award recognizes his nearly 50 years of work in water quality protection and water conservation education, especially relating to Lake Tahoe. Westergard is past director of DCNR and played a key role in the Truckee River Operating Agreement (TROA), which was signed last month after 20 years of negotiation. A major focus of TROA is water quality. CARSON CITY, Nev.—Nevada’s State Engineer Tracy Taylor released his ruling today on the Cave Valley, Dry Lake Valley and Delamar Valley water right applications filed by the Las Vegas Valley Water District. The applications are now held by the Southern Nevada Water Authority. 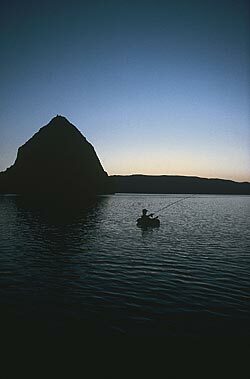 Taylor’s ruling grants to SNWA 18,755 acre-feet of water annually. LVVWD applied for 34,752 acre-feet annually in applications that were originally filed in 1989. To say these are trying times is an understatement. State revenues continue to be weak, resulting in the need for DCNR’s administration and budget staff to evaluate further cuts for the 2009 fiscal year as well as the next biennium (more below). These reductions have the potential to fundamentally change the way we do business and achieve our agency mandates. I will continue to work with the agency administrators to identify the necessary budget reductions while still providing essential services to our customers and regulated communities. I would like to thank DCNR’s Deputy Director, Kay Scherer for her hard work and professionalism in understanding the extremely complicated reduction directives and guiding us through this process. It is critical we make our reductions in a logical and strategic way, understanding the implications to our programs, employees and Nevada’s citizens. I want to make this process as transparent as possible and keep the lines of communication open with all DCNR employees. CARSON CITY, Nev.–The Nevada Supreme Court has unanimously upheld Carson City’s 1885 priority to water rights in Ash Canyon. When Carson ran into regulatory troubles eight years ago, the state temporarily canceled the city’s permit to use the water. The city owns 60 percent of the water rights to the canyon, but because in many years the amount of water is very limited, that priority is important. CORRECTION: This article was updated with new and correct information at 10:13 a.m. Feb. 5, 2008. The Nevada State Engineer will be holding water rights hearing on applications filed for Cave Valley, Dry Lake Valley and Delamare Valley Monday, February 4 through Friday February 11, 2008. The hearing will be broadcast live at the Nevada Legislature Web site: http://www.leg.state.nv.us/audio/AudioVideo.cfm. The hearing will begin promptly at 9:00 a.m. on Monday, February 4, 2008, continuing through Friday, February 8, 2008, and reconvening at 9:00 a.m. on Monday, February 11, 2008, continuing through Friday, February 15, 2008, to be held at the Nevada Legislature, 401 South Carson Street, Room 1214, Carson City, Nevada. Please note that the room will be moved for Thursday and Friday, February 7 and 8 to Room 4100. Public comment will be taken on Friday, February 8, 2008 and written public comment will be accepted until Friday, February 29, 2008. Oral public comment will be taken in Carson City, Las Vegas, Caliente and Ely on Friday, Feb. 8, 2008, beginning at 9:00 a.m.
As set forth in the Intermediate Order and Hearing Notice of Oct. 4, 2007, the State Engineer will accept written public comment regarding the use of water as applied for under the applications. The new deadline for written public comments is Feb. 29, 2008. You are currently browsing the archives for the Water Rights category.